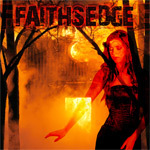 Faithsedge is a new band out of Huntington Beach, California started by singer and songwriter Giancarlo Floridia. The band my be young but has boatload of talent and experience. Floridia has worked with producers Mike Talanca (David Bowie, Foreigner) and Juan Croucier (Ratt); bass player Fabrizio Grossi with Steve Lukather and Alice Cooper; guitarist Alex De Rosso with Dokken and others; and, drummer Tony Morra with Rebecca St James and Van Zant plus additional projects. Faithsedge musical style probably best fits melodic hard rock with a metal edge; it will probably remind many listeners of the late Eighties sound, still popular and thriving in Europe to this day. Eleven songs fill Faithsedge debut: excepting one ballad, they're all strong rockers. Yet, at the onset, there's a feeling of redundancy across this work, the feeling that you've heard this all before. There's no need to quibble over musicianship or the arrangements as Faithsedge delivers on both. All the songs are quite good but, honestly, I found nothing truly gripping. Good, yes, but not overly compelling. Yet, some songs are more ambitious and, therefore, notable including the diverse Somewhere in Your Heart, the arena ready rock of That's What Happened to Us and There's Still Hop, and the groove and latent blues of Faith-Anne. If you sense some ambivalence on my part towards Faithsedge's debut, you're quite correct. However, the more I listen the more I'm impressed, and patience is likely the key to enjoying this work. It's not enough to say that this is simply derivative melodic hard rock with a metal edge. Rather it's authentic and quite well done, and so also quite entertaining. This is a fine start for Faithsedge. Recommended! With a truckload of talent, Faithsedge debut with a strong work of classic melodic hard rock with a metal edge. Big talent offer the promise of some entertaining music.